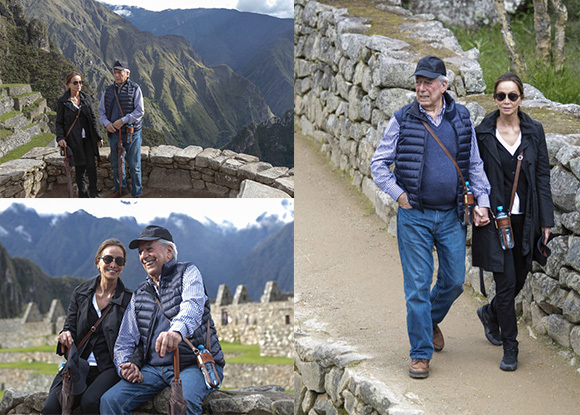 The Peruvian writer and Nobel Prize for literature Mario Vargas Llosa and his future wife, the socialite Isabel Preysler, visited the archaeological park and wonder of the world Machu Picchu on Saturday, during their visit to this important Inca citadel, both were impressed with So great stone construction that led them to stop for a few minutes in each place of the citadel, especially when they passed by the Intihuatana and the three windows, where Isabel Preysler was seen asking very curious the guide that accompanied them. The author of "The Feast of the Goat" recognized that he had visited the archaeological of Machu Picchucenter 3 times in previous occasions, and that the last time was in the '70, which genre will congratulate all the improvements that were implemented and that make the Vargas Llosa did not miss the opportunity to leave a message in the souvenir book of the complex: "Wonderful experience back to Machu Picchu (for the fourth time) and see that the old Peruvians were able to Defeating the gods of the mountains and building this city in the middle of the mountain range and jungle, which brings together architecture and artistic beauty, I hope to return even more times to this extraordinary creation "
As it is remembered, this visit is part of the 10-day tour that Vargas Llosa, his girlfriend and entourage will make in Peru, which began in Arequipa where he celebrated his 81st birthday on March 28th and then embarked on the city of Cusco . 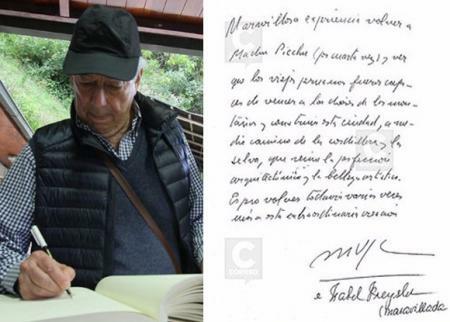 During his walk through the main square of the city of Cusco, a passerby unexpectedly asked him of a shout "Don Mario, marriage, for Peruvians please", to which the author of "The city and the dogs" replied: "Marriage ?, I'm going to get married here in Cusco", so it is expected that Vargas Llosa and Isabel Preysler will choose the millenary city of Cusco as a place for their marriage. Take advantage of our offer of travel to Peru and Enjoy the beauty of Machupicchu, the Inca Trail and Huayna Picchu, make your reservation with the best travel and tourism agency Machupicchu Travel, which has the best Peruvian airlines and the best hotels in Peru.